The insect. 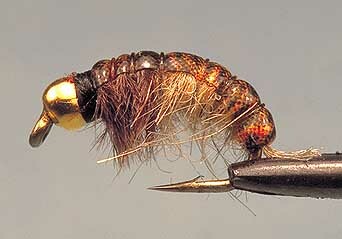 Caddis are members of the order Trichoptera designating that they have hair-covered wings. The tip-off in identifying caddis is the tent-shape of the wing. 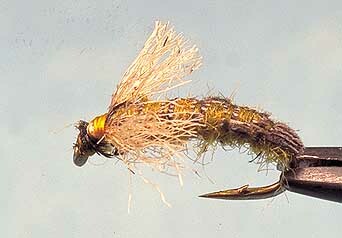 Caddis generally appear to be more plentiful in tailwaters than trout streams. They are also more plentiful in warmer rather than colder waters. It has been suggested that apart from the black caddis, as most caddis feed on plankton which occur in the surface water of reservoirs, top spill dams which pass the plankton over the dams into tailwaters, generally support greater quantities of caddis than tailwaters fed from bottom spill dams. (Caddis fly handbook – Pobst and Richards). Reudi is a bottom spill dam. However we do have good hatches of caddis through the summer and it is therefore an important source of food for trout in our drainage. From the trout fisherman's viewpoint there are three groupings of the caddis larva – net builders, case builders and free roamers. The 'net-builders' spin a net out of silk and catch their food in the net. They mostly stay in the same place, attaching themselves to a spot with the same silk. If the food supply doesn't seem adequate in one spot they will detach themselves and drift downstream a little. The case builders will construct a protective case about themselves. The free roamers, as the name suggests do neither of the foregoing. The caddis larva live on the bottom of a stream or river. Trout may attempt to feed on the bottom but it is far easier for them to be taken when they engage in behavioral drift or when they rise to the surface to emerge. The behavioral drift refers to the mechanism by which caddis larva disburse themselves under water. Essentially they will release their attachment to a particular position and allow themselves to drift to a new location. The manner of drifting can vary between the various groupings noted above. The net builder or free roamer will create a silk like strand to anchor themselves as they move position. This results in the caddis larva dangling in the current and becoming vulnerable to feeding trout while the larva relocates itself. On the other hand, a case builder will release itself from its location while encased, and permit itself to be moved or drift along in the current before it relocates itself. Part of the larva protrudes from the end of the case during this process to be able to control itself giving rise to the aptly named peeking caddis patterns. The Frying Pan River being a tail water below Reudi is vulnerable to sudden fluctuations in flow, particularly in the height of summer. A sudden change in flow may catch larva unaware and wash them downstream making them more vulnerable to fish. So if you notice that the water flow has increased suddenly, watch for this phenomenon. Larva will also move from the bottom when they are beginning to enter the pupal stage prior to emerging. Different caddis will behave a little differently at this point. Some will remain near the bottom of the river in the pupal stage drifting along a distance before rising. Others will rise in the pupal stage. Either way they move to the surface and become immobile while emerging. This is the point of greatest vulnerability. When the adults emerge they flap their wings several times and then fly off. At this stage, the trout have little chance of getting them. However, when the caddis return to lay their eggs either on the surface or underwater and swim to the surface, they are more available to the trout. Laying eggs. Caddis flies lay eggs in a number of ways. This is important for the fisherman to understand. They can hit the surface, dislodging their eggs or they can either dive or crawl underwater to lay them (ovipositing). If they lay their eggs underwater, they may return several times to the surface. This gives the trout a chance to feed. One can fish either the larva, the pupa or the adult fly. However, the manner of fishing will depend upon the circumstances obtaining at the time. The behavioral drift. When caddis larva release themselves from their position and begin the process of behavioral drift, they become vulnerable to trout. At this point, the three groupings noted above must be recalled and fished accordingly. The net builders, might be encased in some silk or certainly attached to silk as they shift position. Similarly the free roamers are similarly vulnerable. Imitations of these larva will be fished with some weight but will imitate the drifting larva. On the other hand the cased larva will be closer to the bottom and fished with more weight. 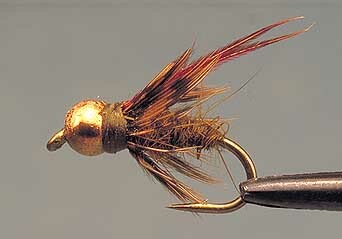 These are the peeking caddis patterns. Pupa. 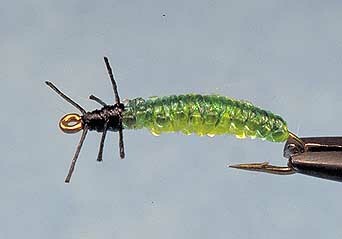 If you choose to fish the pupa pattern lower, then fish them like a nymph or a larva. If you want to emulate the rising pupa, then the fly will be fished a little higher in the water column. Although some pupa will drift along the bottom eventually they all rise to the surface. As they rise they disclose an air sac to the watching trout. Hence the sparkle patterns which emulate this air sac. As they reach the surface the air sac becomes more visible and the pupa is vulnerable to the trout. Emergers. As the pupa is trapped in the sac in the surface it will emerge. At this point the emerger pattern will be fished in the surface film. 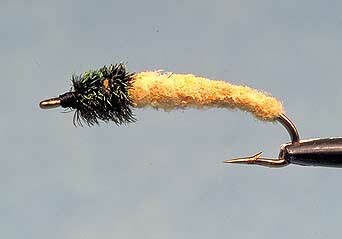 A pupa pattern can also be fished in the same manner. As they will be trapped helplessly in the surface film they should be permitted to drift in the surface current. Egg laying females. As noted above, because some females crawl or swim underwater to lay their eggs, and the trout will feed on them when they are either entering the water or when they are returning to the surface, it may be hard to tell whether the fish are feeding on pupae, emergers or ovipositing females. The simple solution is to be prepared to fish with at least 2 flies. 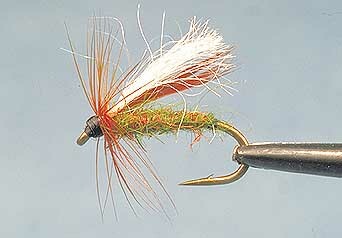 A dry fly with a pupa, emerger or a soft hackle dropper certainly increases the anglers options. If you are confident enough, use a third fly such as a dry fly similar to having a strike indicator. The other 2 flies will be fished as if one was nymphing. When the female enters the water, she must do so with some force to break the surface tension. If it hits the water with enough force, it may be momentarily stunned before reviving and forcing itself down into the water. On the other hand, females returning to the surface might also be momentarily slowed in their progress through the surface tension. 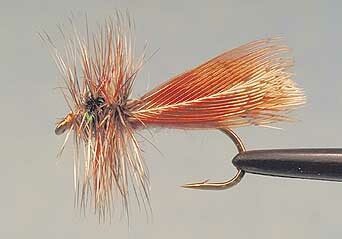 So either way, a dry fly in the surface film will attract the attention of a trout. As the insect will be motionless for a moment the trout will not necessarily take the fly aggressively. However, as the caddis revives itself and starts to move the trout will see a twitch or slight movement. This can be imitated by the fisherman with a little practice. 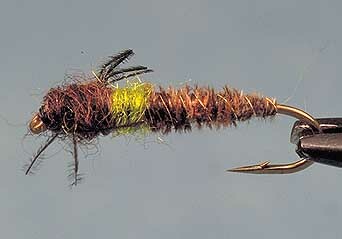 If fishing with a dry as an indicator and 2 other flies, the other flies might then be a soft hackle pattern or an emergent pattern with the bottom fly being a bead head pupa which will serve to stretch out the line. The other thing to remember is that that presence of caddis in the bushes and trees along the river bank does not equal feeding fish. Fish eat what is in the water. So the presence of caddis flying around is generally more relevant when they are laying eggs and either touching the surface or diving underneath. 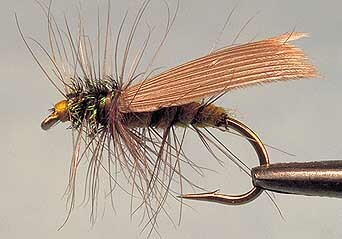 Finally, if caddis are spent and on the water, they will be attractive to trout. So carry a spent pattern for this option. 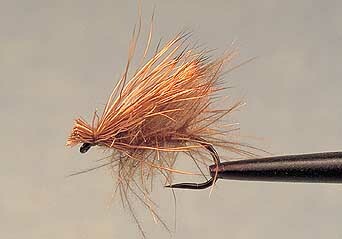 Deep Sparkle Pupa; Bubble Caddis, Caddis Poopah; Buckskin Caddis. 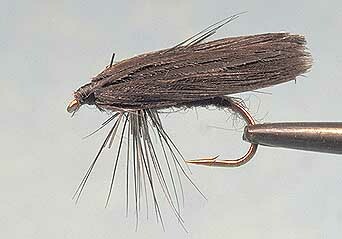 Z-Wing Caddis; Names Mothers Day Caddis; Danger Baby; Caddis Emerger Palm. 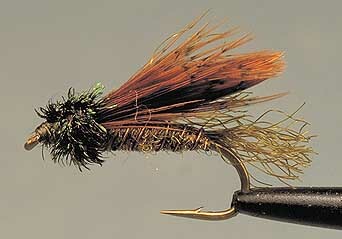 Elk Hair Patterns; Goddard Caddis; Real Caddis; Sparkle Caddis; Irresistible Caddis; Kings River Caddis; Hemingway Caddis; Twilight Caddis; Slow-Water Caddis; Small Tan And Olive Stimulators #16, #18. La Fontaine Diving Caddis; Beadhead Flashback.